The house at 26 Bredgade, on the corner with St Anna Plads, was first leased by ministers in 1854, by the Office of Works in 1879 and was bought by the Office in 1898 for about £22,000. The house (see Note below) was built in 1754 on one of the key sites in the new Amalienborg quarter that was then under development just outside the old town. The owner and builder was Christian Jensen Lintrup, who made a fortune with the Danish East India Company. It is said that the design was by Niels Eigtved, the king’s preferred architect, and that the master mason was J.C. Conradi. Certainly, it was built of limestone blocks from Lintrup’s own quarry. He was soon after ennobled as Lindencrone. The garden to the rear of the house was sold in 1796. The property was bought by AC Fibiger, a manufacturer of canvas, in 1840, and leased by him to the British minister, Andrew Buchanan, in 1854. It then served as the legation house, with chancery in the northern half of the ground floor, for successive ministers until the Second World War, during which the mission was withdrawn. After the war, the status of the mission was raised to an embassy, and the offices moved out of the house. 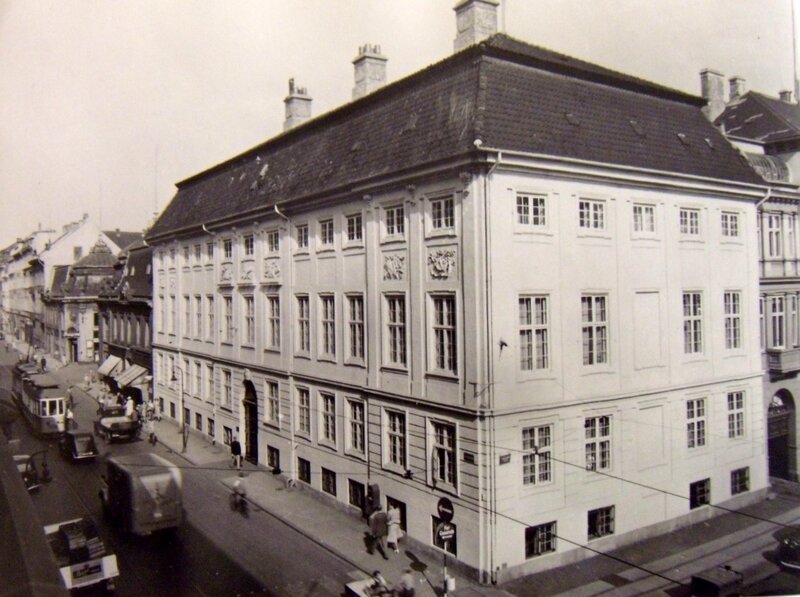 Ambassadors found the house most congenial but in 1963, when fine residences were under fire from Parliament for financial and image reasons, searches began for an alternative to Bredgade. As a result, a promising site at 2 Bernstorffslund Alle in Charlottenlund was bought in 1967 from Mrs Lilian Monica Jensen with a view to demolishing the house on it and building anew. It was a contentious decision. The Minister of Public Building and Works, Robert Mellish, was asked in Parliament whether he would agree that ‘selling the present Embassy, which is beautiful … and replacing it with a suburban building which will stand a 50-50 chance of being pretty ugly thanks to modern architects, is very false economy indeed?’. Mellish replied that ‘All the expert advice is that we should sell it and buy a new property, and build a new Embassy which will be a credit to Britain – and I believe that there are good architects available to do that’. After a spectacular volte-face by one ambassador in 1968 (described in Room for Diplomacy pp 398-9), and hints that both Royal Families would be dismayed by proceeding, the proposal to build on 2 Bernstorffslund Alle and sell Bredgade was dropped. It was also feared that the upheaval would not be conducive to both countries’ negotiations to enter the European Economic Community (achieved, with Ireland, on 1 January 1973). The question of the future of the Bredgade residence was next visited in 1978, after 2 Bernstorfflund Alle had been sold in 1977 and when Bredgade badly needed a hugely expensive refurbishment. This time it transpired that there was a satisfactory alternative residence available: a house called Bernstorffshoj, at 6 Ved Slotshaven in Gentofte. It had been identified in 1967 as a potential alternative to Bredgade if ever its owner, Princess Margaretha, was to leave it, and now she had. The house was originally one of two built in the second half of the nineteenth century at the edge of the park of Bernstorff Slot. Prince Axel, and his Swedish bride, Princess Margaretha, were given Bernstorffshoj as their wedding present in 1919. It was severely damaged by fire in 1936 and they re-built it on a grander scale, and with up to the minute fixtures, in 1937, employing Helweg Møller as architect. 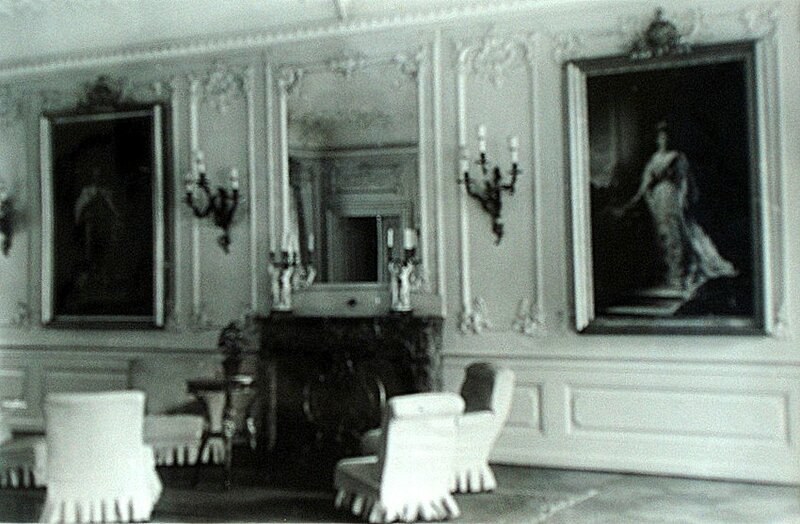 Princess Margaretha continued to live in it after the death of her husband in 1964. Her executors, failing to find a buyer, were on the point of deciding to demolish the house and sell the grounds as six separate plots when the ambassador, Anne Warburton, heard about it, visited it privately and told London that it would do if they really wanted to sell Bredgade. The Property Services Agency bought the house in 1978 and returned it to good condition after its years of neglect by the widowed princess. Most of the land belonging to the house had been sold separately as building plots and the former park had been reduced to a mere garden, where the Agency also built a garage and staff quarter. The new residence was ready, after a scramble, for the ambassador, Anne Warburton, to move into it just before the State Visit of Queen Elizabeth II in May 1979. 26 Bredgade was sold soon afterwards. It is now called the Lindencrone Mansion, and remains one of the best preserved rococo mansions in Copenhagen. 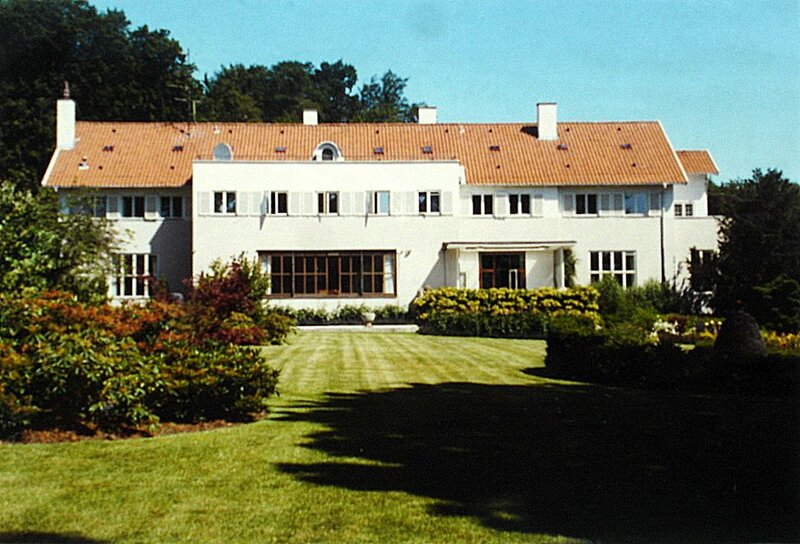 At the end of the Second World War, the British Military Mission in Denmark expropriated a row of three villas, Nos. 36, 38 and 40 Kastelsvej, in the Ostervold quarter, which had formerly been the residence (No. 36) and offices of the German embassy. The three houses were handed over to the Danish government in 1946 and were subsequently leased as offices. For most of the rest of the century, No. 36 was occupied by Commercial Section, No. 38 by Management and Consular Sections, and No. 40 by Chancery, with a sprinkling of junior staff flats. Nos. 38 and 40 were joined by a first floor bridge in 1967. The building leases were converted to freeholds during the 1970s (No. 36 in 1972 for £70,000, and Nos. 38 and 40 in 1976 for £250,000) but the Kommune (Copenhagen Council) was granted the right to repurchase them at the end of any 10 year period (1982 being the earliest opportunity), in accordance with specified price terms. A subsequent agreement (the 1995 Deferment Declaration) provided that, for a payment of Danish Krone 7 million (order of £800,000), the Kommune’s repurchase option was deferred until 1 January 2082 (again on specified price terms). 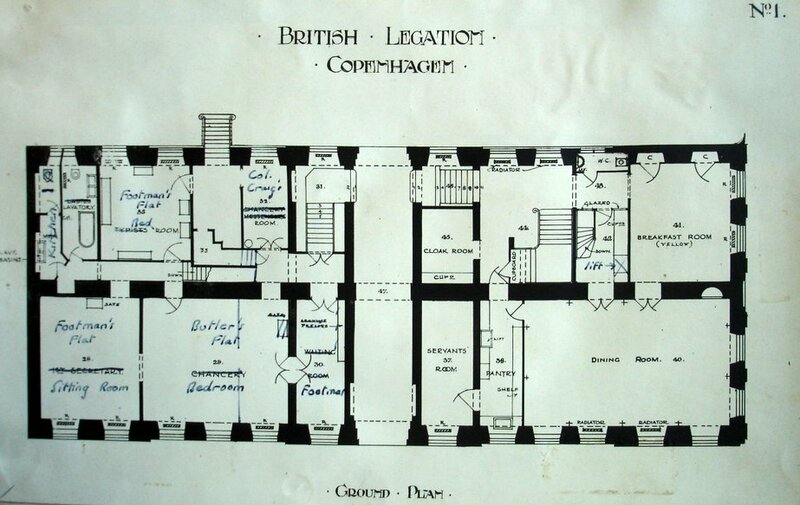 ‘The British Ambassador’s Residence in Bredgade’ by Ejner Johansson in Berlingske Tidende, 21 May 1957, provides a fuller account of the Bredgade residence. A site was bought in 1901 and a consulate built on it the same year for £2,000. The property was sold in 1922 to the directress of the Young Women’s Christian Association for £1,666. 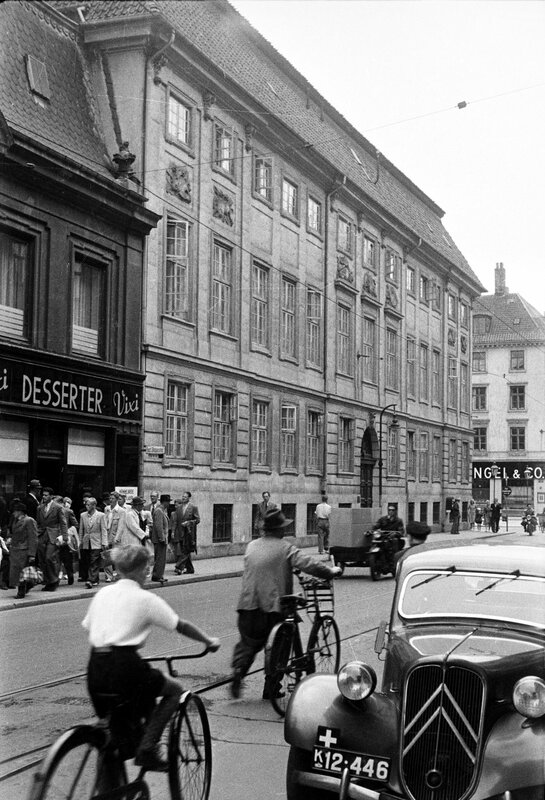 Residence on the corner of Bredgade (to the left) and St Anna Plads (to the right), 1951. Residence ground floor plan, with flat occupying former chancery space (on left). 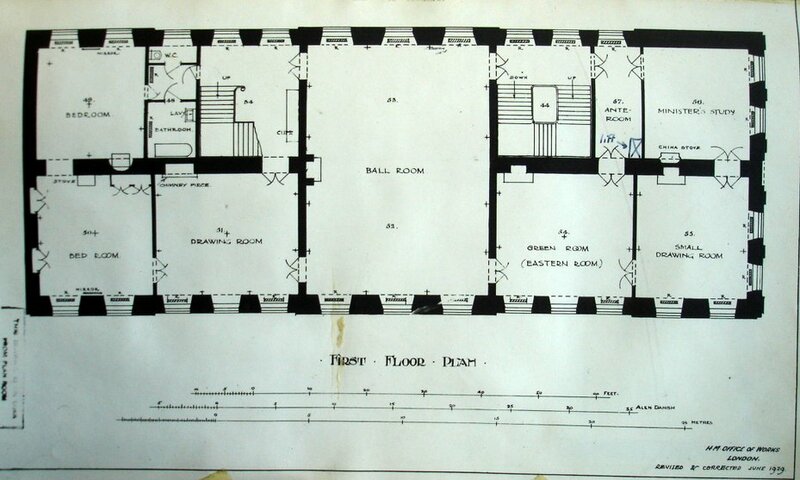 Residence first floor plan, 1929, with ballroom at centre, formed in 1906-8 from two former rooms. Residence, looking south-west down Bredgade, 1962. 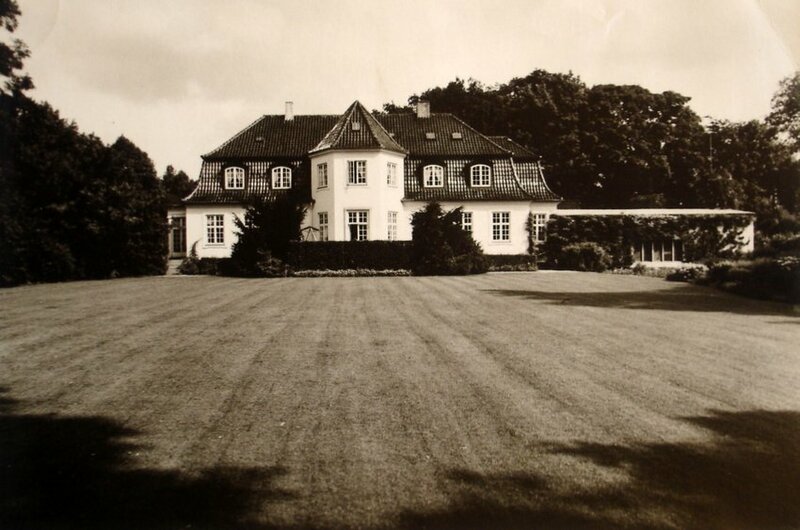 Garden front of 2 Bernstorffslund Alle, 1967. Garden front of Bernstorffshoj, 1990s.